"What is Classical is healthy; what is Romantic is sick." --Goethe. 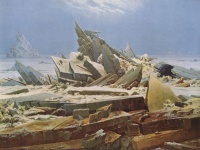 In the philosophy, art, and culture of German-speaking countries, German Romanticism was the dominant movement of the late 18th and early 19th centuries. 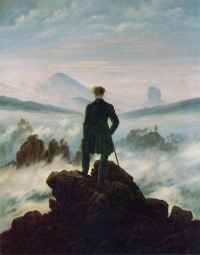 German Romanticism developed relatively late compared to its English counterpart. In contrast to the seriousness of English Romanticism, the German variety is notable for valuing humor and wit as well as beauty, although there is also a dark strain of romanticism, called Schwarze Romantik. The early German romantics tried to create a new synthesis of art, philosophy, and science, looking to the Middle Ages as a simpler, more integrated period. As time went on, however, they became increasingly aware of the tenuousness of the unity they were seeking. Later German Romanticism emphasized the tension between the everyday world and the seemingly irrational and supernatural projections of creative genius. Heinrich Heine in particular criticized the tendency of the early romantics to look to the medieval past for a model of unity in art and society. Key works of German Romanticism include The Sorrows of Young Werther (1774) by Goethe, The Robbers (1781) by Friedrich Schiller, Lucinde (1799) by Schlegel, Heinrich von Ofterdingen (1802) by Novalis and Nightwatches (1804) by Klingemann. German romanticism seems to have interacted with the Gothic craze in England by fairly direct translation. Hoffmann's The Devil's Elixirs was written in 1814, and translated into English in 1824. Hoffmann can, even in his short stories, be described as gothic. Carl Maria von Weber. Perhaps the very first of Romantic musicians, if we exclude Beethoven, in the sense that Weber was the first major composer to emerge as a wholesome product of the Romantic school, as contrasted with Beethoven, who had started off as a Classicist (see below). The emotional intensity and supernatural, folklore-based themes in his operas presented a radical break from the Neoclassical traditions of that time. Franz Schubert. Universally acknowledged as the greatest composer of German Lieder; called 'the most poetic musician ever' by Franz Liszt. Robert Schumann. Primarily a miniaturist of piano music, his works recall the nostalgia of lost childhood innocence, first love, and the magnificence of the German countryside. As an influential critic, he played a major role in discovering new talents, among them Chopin and Brahms. He stands at the forefront of German Romantics. Felix Mendelssohn Bartholdy. A composer of the Early Romantic period, together with such figures as Schumann, Chopin and Liszt. One of the persons responsible for reviving interest in the almost-forgotten music of Johann Sebastian Bach. Franz Liszt. Liszt was by nationality a Hungarian, but nevertheless he spent much of his most fruitful years in Germany, and his first language was German. His flamboyant style, seen in such pieces as his 'Hungarian Rhapsodies', the first piano concerto, the 'la Campanella' Etude, and the 'Fantasia on Hungarian Themes', makes him the 'Byron' of Romantic music. Credited as the inventor of the tone poem. In his old age, Liszt adopted a more dissonant, ominous flavour, characteristic works being 'la Lugubre Gondola' and 'Die Zelle in Nonnenwerth'--predating Impressionism and 20th century atonalism. Johannes Brahms. His works are cast in the formal moulds of Classicism; he had a profound reverence for Beethoven. Brahms was also attracted to the exoticism of Hungarian folk music, and used it to good effect in such pieces as his famous 'Hungarian Dances', the final movement of his violin concerto, and the 'Rondo alla zingarese' from the piano quartet. Richard Wagner. The greatest composer of German opera; was an exponent of Leitmotif. One of the main figures in the so-called War of the Romantics. Ludwig van Beethoven. Considered by many to be the greatest composer who ever lived. In his earlier works, Beethoven was a Classicist in the traditions of Mozart and Haydn (his tutor), but his Middle Period, beginning with his third symphony (the 'Eroica'), bridges the worlds of Classical and Romantic music. Because Beethoven wrote his greatest music after he became totally deaf, he embodies the Romantic ideal of the tragic artist who defies all odds to conquer his own fate. His later works portray the triumph of the human spirit, most notably his 'Choral' Symphony No. 9; the stirring 'Ode to Joy' from this symphony has been adopted as the anthem of the European Union. Unless indicated otherwise, the text in this article is either based on Wikipedia article "German Romanticism" or another language Wikipedia page thereof used under the terms of the GNU Free Documentation License; or on original research by Jahsonic and friends. See Art and Popular Culture's copyright notice. This page was last modified 08:13, 9 February 2015.